Here’s another old one for you. This photo was recently added to our archives, courtesy of Aunty Win Williams, whose husband Trevor was a member of this Russell senior rugby team when he was still a student at Kawakawa District High school. On this day in 1946 they played against Kaikohe, at Kaikohe, and were beaten 36 – 6. However they had some guns lined up against them – the Kaikohe team included JB and Peter Smith, Stan Young, Charlie Stirling and a number of Bay reps. The Russell lads wore old Russell School jerseys: thick wool, no collar, blue and white hoops. Trevor recorded these details on the back of the photo. 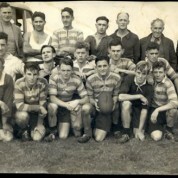 In the photo are, from left to right: Back row – Morrie Larkin (coach), Mac Hau, Jack Maioha, Merv York, Alan Grant, Sid Irving, Sam Maioha (sec); Middle row – Lionel Williams, Ces Ollerenshaw, Don Brooker, Neil Wark, Bob Irving ; Front row – Mattie Rivers, Dean Moyle, Trevor Williams, Alwyn Rotherham(capt), Colin Moyle, Ron Simpson.